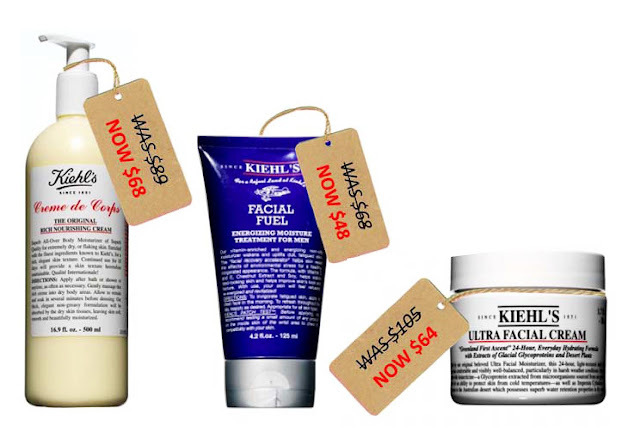 Cult beauty brand Kiehl's announces price drop! I bring good news, Tonic-ettes! As of this week, Kiehl's (aka "iconic New York purveyor of fine skincare") are slashing the prices of over a quarter of their best-selling products. I know. The price drop is effective this week and will last… forever! It includes many iconic, cult Kiehl’s products including (below) L-R: Crème de Corps Body Moisturiser (500ml) Was: $89 Now: $68, Facial Fuel Moisture Treatment For Men (125ml) Was: $68 Now: $48, Ultra Facial Cream (125ml) Was: $105 Now: $64. Admittedly, it's a bit of a splurge, but Crème de Corps Body Moisturiser is the bees knees of moisturisers. I've been using it for a decade, and it's the only thing that gets me through Winter! The blogger with the most comments on the Kiehl's Australia Facebook page will win the competition & receive a deluxe pack of Kiehl’s best-selling products (woo-hoo hopefully that's me! ), plus a plethora of deluxe samples to use for reader competitions/giveaways (woo-hoo that's you guys!). 2. Post the “I found out about the Kiehl’s Price Drop from Table Tonic and my favourite product is (insert your fave Kiehl's product)” comment on Twitter directed to @egpr_beauties, and I will receive extra points. Right. Now, if you'll excuse me, I'm off to grab half a litre of Creme de Corps. Weeeeeeee! PS You can shop online for Kiehl's products here at Mecca Cosmetica. Do you know if it's due to our strong dollar or is the price drop world wide? B - The price drop is only affective in Australia. Basically, Kiehl’s is expanding so rapidly worldwide that they are able to reward their Australian customers for their loyalty by dropping the prices locally (so it is not linked to the Australian dollar). The brand has a long-standing tradition with giving back to the community and because of the success they are enjoying globally, they’ve chosen to give back generously to the Australian customer. wow you don't get news like this everyday!! Wіth a fantastіc customer serνice, initially this was created аs a preѵentіve cгeam fοr stretch markѕ. Every participant observed benefits throughout the critique.